Scott was born April 26, 1970, the son of Darrell and Linda (Burns) Critten. 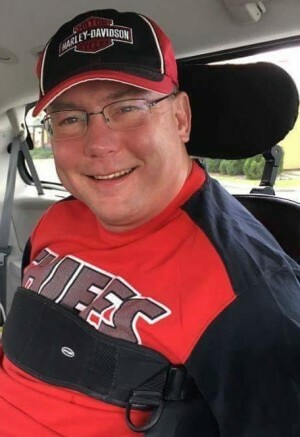 He graduated from Gallatin High School in 1988 and was a lifelong resident of the community. As a young boy, Scott was a typical kid who loved to ride three wheelers and lawn mowers, sometimes at a fast rate of speed and hang out with his friends. At an early age Scott became stricken with Friedreich’s Ataxia disease, but he would not allow it to define who he was. He was a long-time member of the First Baptist Church in Gallatin and greatly enjoyed his Church family. His faith was strong and carried him through his journey in life. As Scott eventually became confined to his wheelchair, he battled with courage and quiet dignity his entire life. His ever-present smile, and the warmth and depth behind it, was a trademark of who he was. He could light up a room when he flashed that smile. It was a sheer pleasure to be in his company. His strong faith in God, love of family and friends was truly his signature. Scott was a winter Floridian and each year so looked forward to every new adventure with his Mom and Dad. He met and made many friends along the way. Scott cared about people in the purest way and in return Scott was loved and embraced by the entire community. He was a true friend to friends – ready and willing at a moment’s notice to take a road trip adventure. “What you saw was always what you got with him, and what you saw – if you were lucky enough to be his friend – was a truly delightful, generous, easy-going, fun-loving human being.” We should all take a lesson out of the book of life that Scott lived. His goodness, faith, strength, love of family and friends, and the ability to make the most out of each and every day no matter the struggle, made him the inspiration he was to so many. The world is a lesser place without him and we will greatly miss him. We take comfort in knowing that he and Stacy are once again together. God’s Speed Scott! May you soar with the Eagles and walk tall in the Kingdom of God. Scott was preceded in death by his paternal grandparents, Maurice and Dorothy Critten; maternal grandparents, Gerald and Dorothy Burns; his sister, Stacy; uncles Roger and Karl Critten; and aunt Vickie Burns.